Congregation has history of opposition from Islamists. TIZI-OUZOU, Algeria, (Morning Star News) – Unknown “thugs” who wrote a jihadist slogan on a church building in the center of this city on the Algerian coast on Thursday night (Jan. 7) looted and damaged the property, sources said. The assailants vandalized or stole furniture, worship items and money worth about US$8,000 from the Light (Tafat) Church late Thursday night or early Friday morning, pastor Mustapha Krireche told Morning Star News. Church leaders filed a complaint with the city’s police commissioner, and Tizi-Ouzou investigators arrived at the site on Friday morning (Jan. 8). The city is 100 kilometers (62 miles) east of the Algiers, the capital. The church, which has about 100 members, is surrounded by upscale houses that would be more profitable for thieves interested solely in material goods and money, sources said. It was not the first time the church has met with trouble. 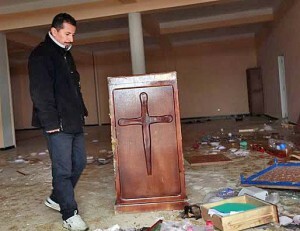 In 2009, about 20 Islamist neighbors tried to block the congregation of the Protestant Church of Algeria (EPA)-affiliated church from meeting for worship. With verbal taunts and threats, they confronted the congregation hoping to provoke them into a conflict, but the Christians declined to respond. Police managed to restrain the provocateurs and restored calm but took no action against them, sources said. 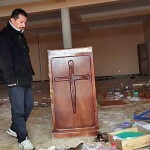 In January 2010, a group of Islamic extremists rampaged through the church building, trying to burn it down and damaging property, including Bibles and a cross. No one was injured. The church has been able to obtain a permit for its worship building, unlike many EPA-affiliated congregations. Under a 2006 law governing non-Muslim worship, meetings can be held only in government approved buildings, with officials often delaying or denying permits. Some non-Muslim groups have continued to experience difficulty when attempting to register with the government, which hampered their ability to carry out a full range of normal functions, according to the U.S. State Department’s 2014 International Religious Freedom Report, the latest available. Making, storing, or distributing printed documents or audiovisual materials with the intent of “shaking the faith” of a Muslim carries the same punishment, according to the report. Algeria’s population is 97 percent Muslim, and only .28 percent of the population is Christian, according to Operation World.